We thought that going into southwest Arkansas would get us away from the Texas drought. Unfortunately it just becomes the Arkansas drought as you cross the border. 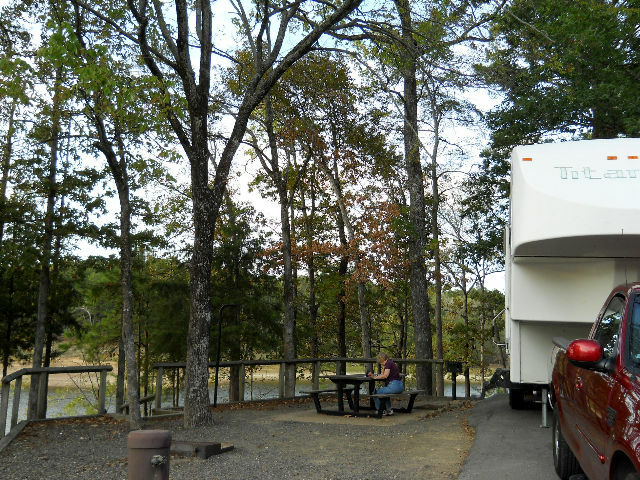 We did make the best of the situation and enjoyed our stops in four Arkansas parks that we had not camped in before. 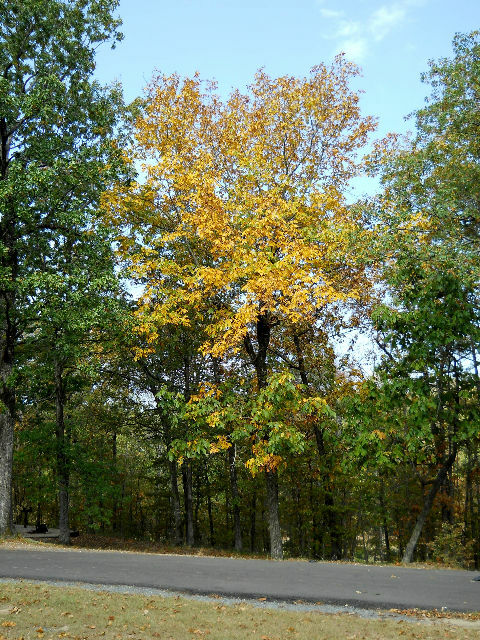 Three were state parks and one was a Corps park. They were all located near a lake or river with lots of trees and birds. The leaves were just starting to turn to their fall colors, but it was still a bit early. We hope you enjoy our trip report. [Monday] October 3rd, we left home about 9:30 am and traveled north on US-59 from Richmond. At Timpson, we took US-87 west to FM-1970, then at FM-1234, we neared our first nightly campground, Murvaul RV Park about 3:30 pm. 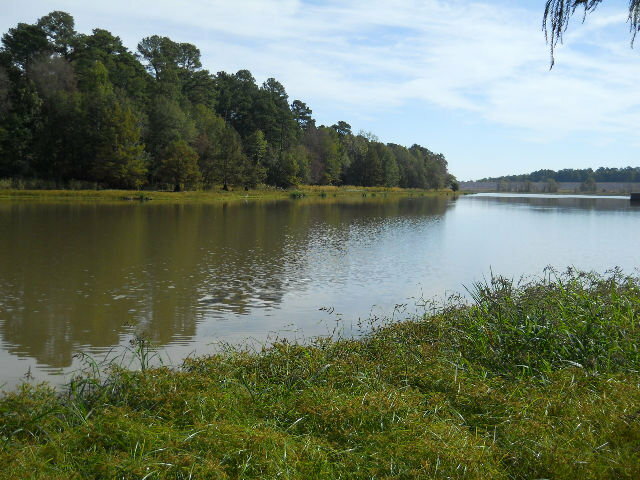 The park is located on the shores of Lake Murvaul, which is operated by the Panola County Fresh Water Supply District #1. It is a nice park. After supper, we walked around the park. 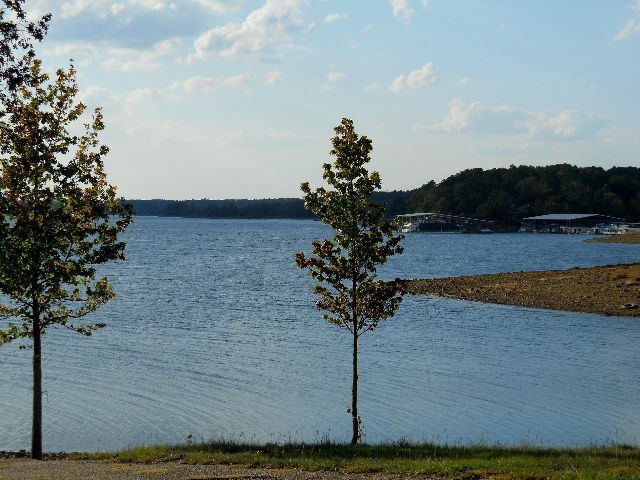 The lake is currently down about 4 feet due to the extended Texas drought. It is still a nice lake for camping and fishing. We will probably stop here again on our return from Arkansas. < Our campsite at Murvaul RV Park. < Lake Murvaul from the marina. [Tuesday] After breakfast we continued north on FM-1970 to Clayton, then TX-315 to Carthage, where we picked up US-59 north. 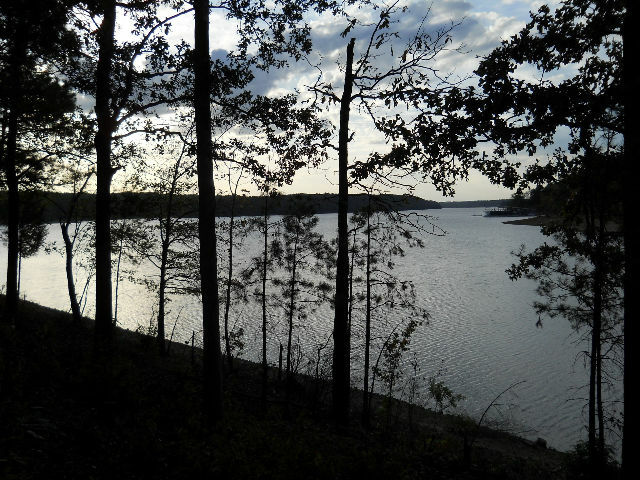 We continued on US-59 through Texarkana to Ashdown, AR, where we took AR-32 east to Millwood State Park, located on the shore of Millwood Lake. We arrived about 4 pm. We discovered at the entrance that the Texas drought has made its way to Arkansas. The Corps of Engineers and the drought have drawn the lake down about 4 feed below it's normal dept. There's still lots of water, but the water near the camping area is now dry ground. 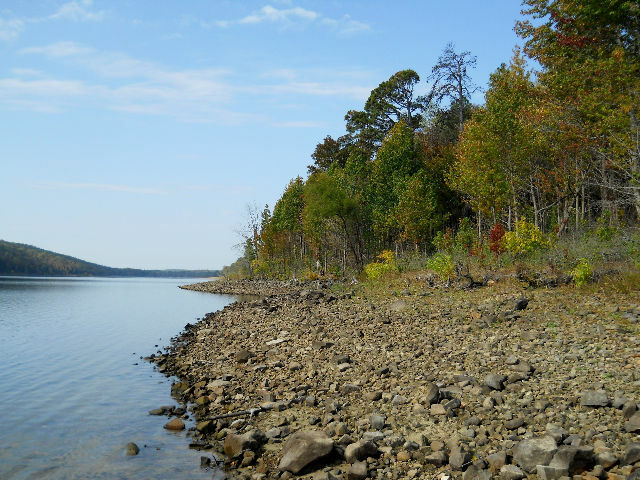 The lake dam is the longest earthen dam in Arkansas. Around sundown, we saw many deer out grazing where it is normally under water. 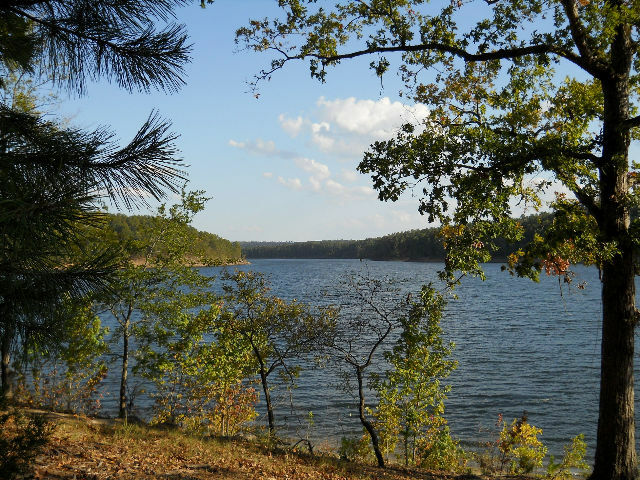 < Millwood Lake State Park site. [Wednesday] There are two hiking trails in the park. We took the 4 mile long Wildlife Lane Nature Trail this morning. With our 1/2 mile walk to get to the trailhead, we chalked up 5 miles. There is a 1 1/2 mile trail named the Waterfowl Way Hiking Trail that we plan to walk Thursday. The Wildlife trail winds through the heavy pine and hardwood forest that lines Millwood Lake, or where the water used to extend before the 4-foot drawdown. We saw Herons and Egrets in the area where the water still stands. 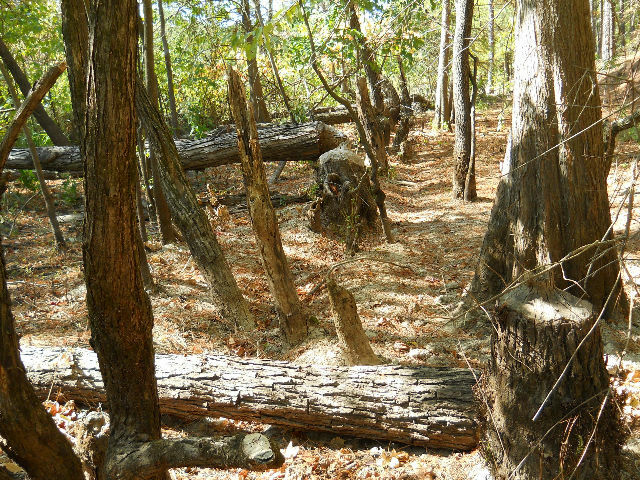 The woods were depressingly dry and many trees were dead or dying. It took us about 3 1/2 hours to take the leisurely hike. On the way back to the trailer, we saw a large number of Bluebirds, Goldfinch, and Red-bellied Woodpeckers in the trees of the campground. 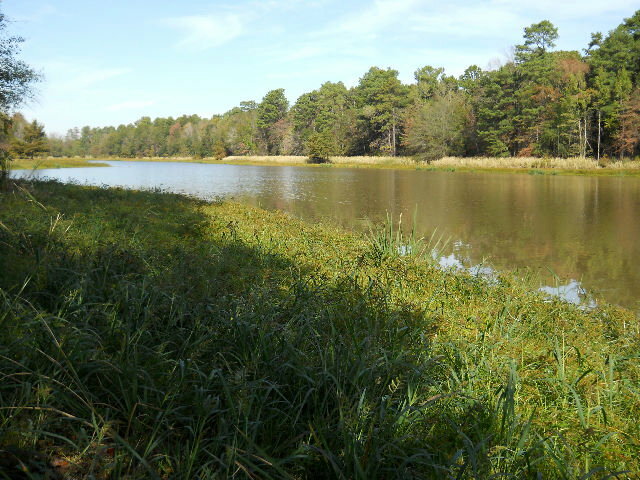 < Vanishing lake from Nature Trail. 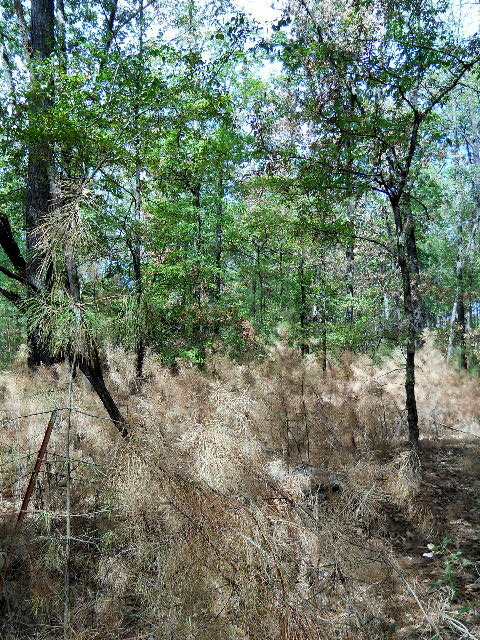 < Effects of the drought on the forest. In the afternoon, we stayed around the campground and after supper we sat outside and enjoyed the wildlife and cool weather. 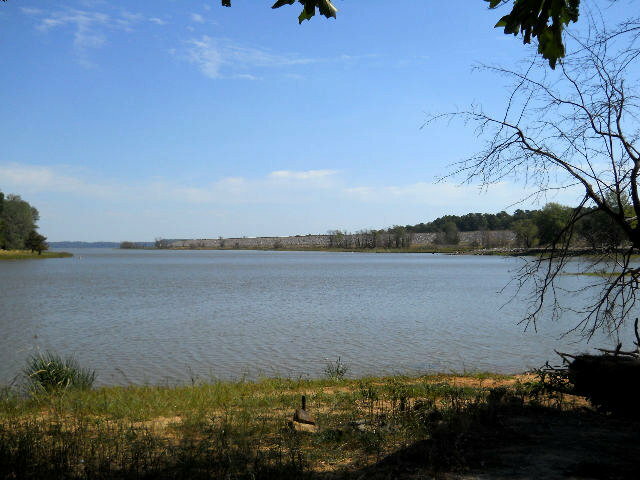 < < Views of the lake from Nature Trail. [Thursday] We went into Ashdown, AR, in the morning and found WI-FI at the McDonalds and downloaded 2 days of emails as we had breakfast. We got back to the campground and started on the Waterfowl Way Trail about 11 am. We walked the 1.5 mile loop. 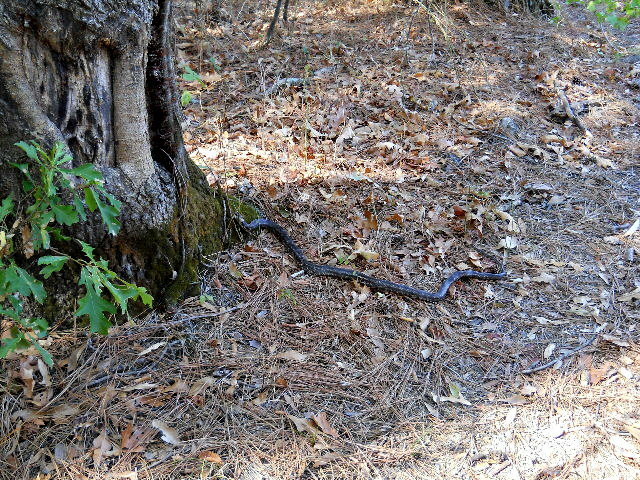 Along the way, we saw an intersting snake on the side of the trail. It looked like it was dead, but when we poked it with our stick, it slowly crawled around to the other side of a tall tree. When we went around to see where it had gone, it was about 2 feet up the side of the tree. It continued to climb the side of the tree up about 15 feet, where it crawled out onto some small limbs. That snake really knew how to climb a tree. Amazing! < Tree climbing snake. < Trees cut down by beavers when the water was higher. < Millwood Lake looking toward the dam. < We almost had the park to ourselves. [Friday] We left Millwood after breakfast and went up AR-32 & AR-27 to Murfreesboro to Crater of Diamonds State Park. We got into site #10 before lunch. After lunch, we took the River Trail through the woods to the Little Missouri River. On the 1.x mile trail we saw some deer, squirels, ducks and geese. 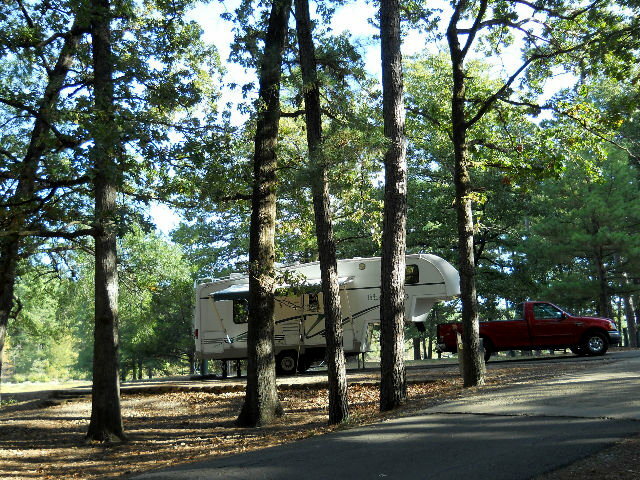 < Our site at Crater of Diamonds State Park. 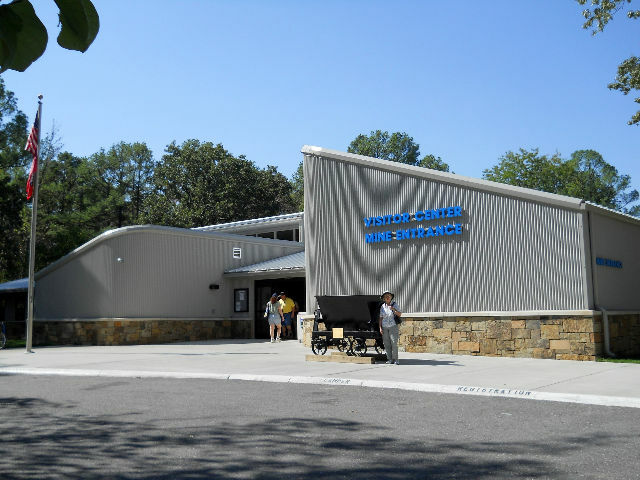 < Visitor Center at mine entrance. 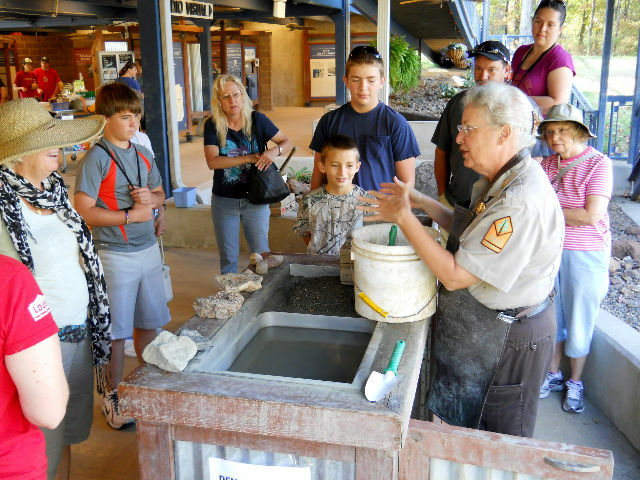 [Saturday] After breakfast we went over to the Visitor Center and purchased our tickets to the diamond mine field. 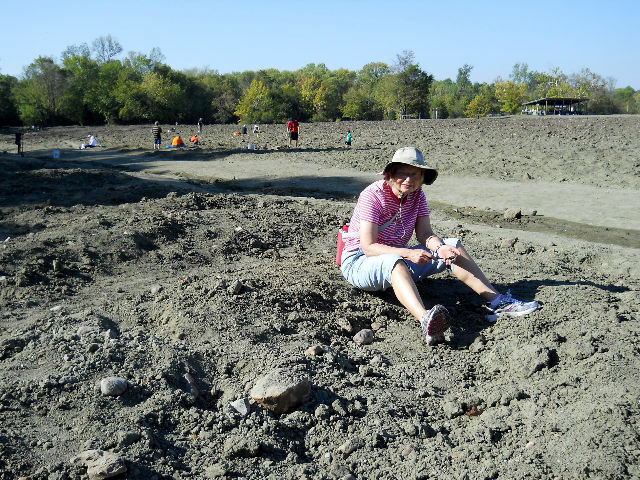 We saw a demonstration on how to sift the dirt and rocks and how to identify an Arkansas diamond. You are allowed to keep any diamond you find, and the post a list of the folks that found diamonds and how big they were. It turns out to be a lot of work and not much if any reward. 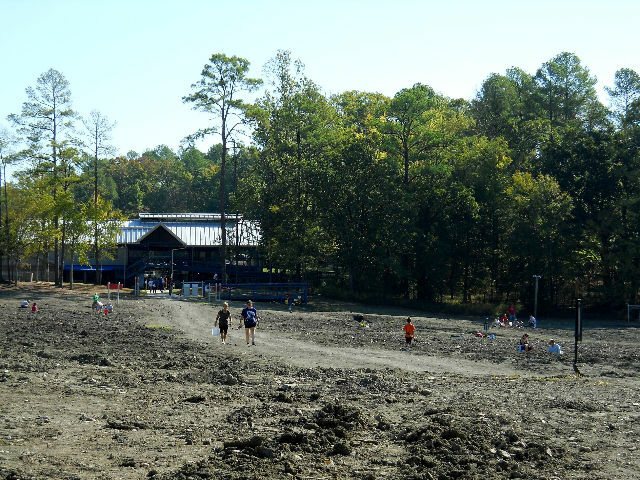 We messed around in the dirt for a little while then called it a donation to the Arkansas Parks department, and left. After lunch a the trailer, we had to leave because we couldn't get a reservation for Saturday night. We moved on up AR-27 and AR-84 to Daisy State Park on Lake Greeson. < How to find diamonds. < Kay digging in the dirt. < Part of the diamond field with Discovery Center in rear. 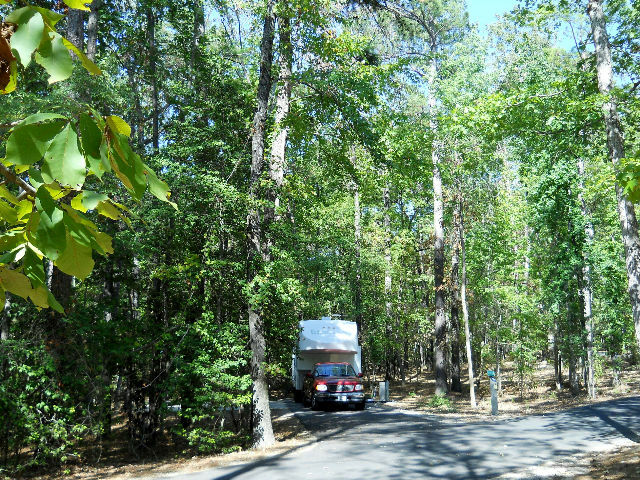 We arrived at Daisy State Park in mid-afternoon and parked in site #20. 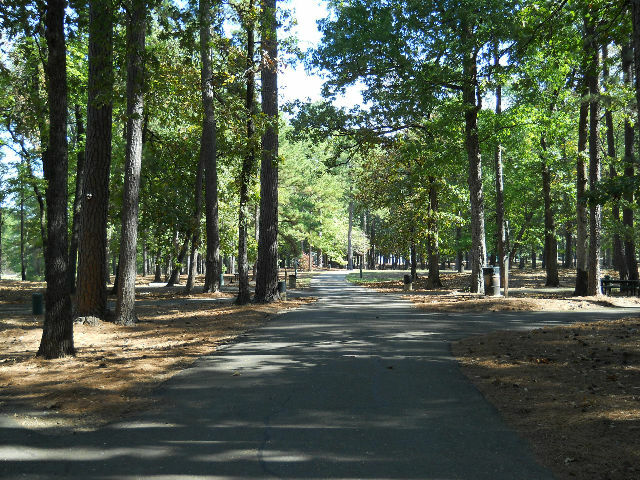 That afternoon, we road through the park, then to the Daisy City Park located across the lake from our campground, then to the Corps of Engineers marina that is also across the lake from our site. [Sunday] After breakfast we walked along the only hiking trail in the park, the Nature Trail. 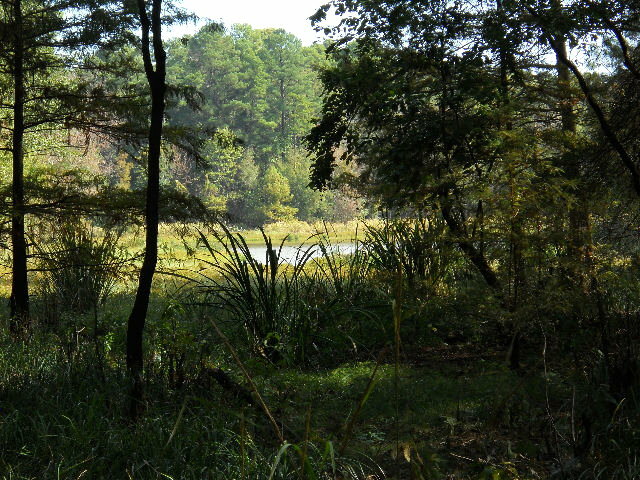 It is a short, possibly one-half mile loop through the woods along the lake. We didn't see much wildlife along the trail. In the afternoon we sat outside in the nice windy mid-80's day and enjoyed seeing lots of bluebirds, titmouse, chickadees, goldfinch, woodpeckers, bluejays and some other birds that weren't so identifiable. 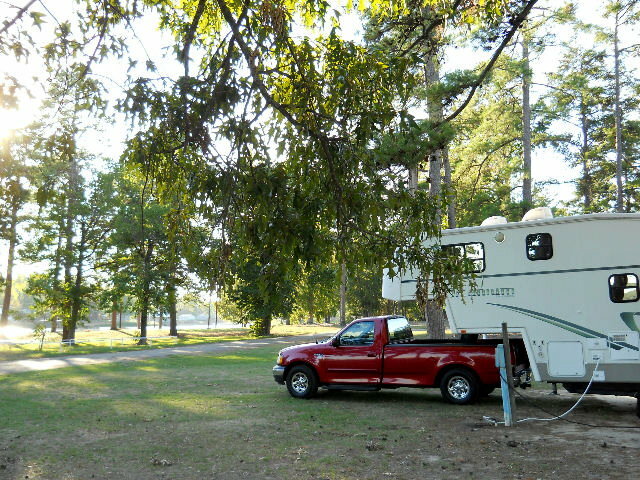 < Our campsite at Daisy State Park. < < < Views of Lake Greeson from our campsite. [Monday] In the morning, we drove over to the Interpretive Center to use the open Wi-Fi to check our emails. We ate lunch and left Daisy on US-70 west. Just west of Dieks, we went north 4 miles on Greens Chapel Rd to Jefferson Ridge Campground. 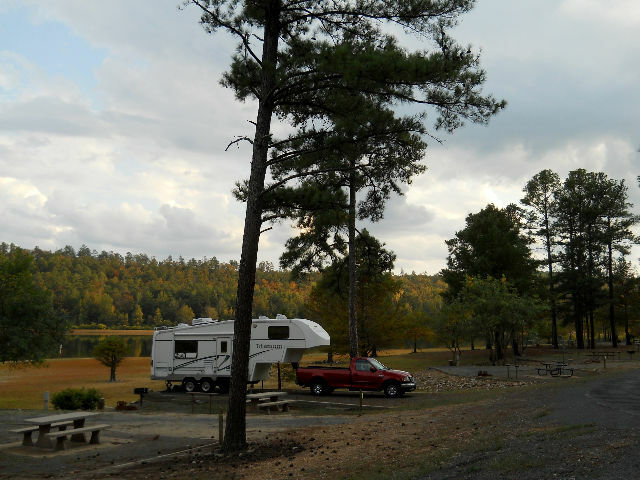 This campground is on Dierks Lake and is operated by the US Army Corps of Engineers. We camped in site #3 of loop 1, located right on the shores of the lake. < Our campsite at Dierks Lake. 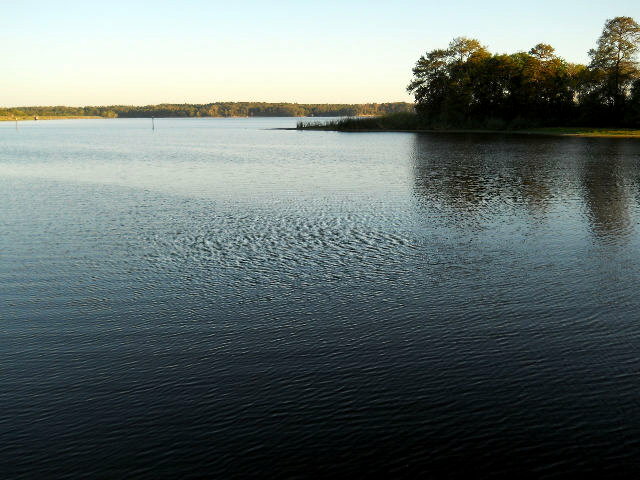 < View of Dierks Lake from boat launch. [Tuesday] It was a beautiful day so after breakfast we walked from our camping loop along the ridge campsites on the road to the boat launch. There was quite a community of folk from Arkansas and Texas that were spending a month or more in the park. The sites were wooded and not too far from the water. We arrived back at the trailer at noon. After lunch we sat around the trailer. Late in the afternoon we spotted a bald eagle sitting in a tree across the lake from our site. We sat outside until it flew to a tree further down the lake. This is an impressive bird to see in the wild. < Some fall colors are starting. < Ridge road to boat ramp. [Wednesday] Well, it's time to start moving back south toward Houston. 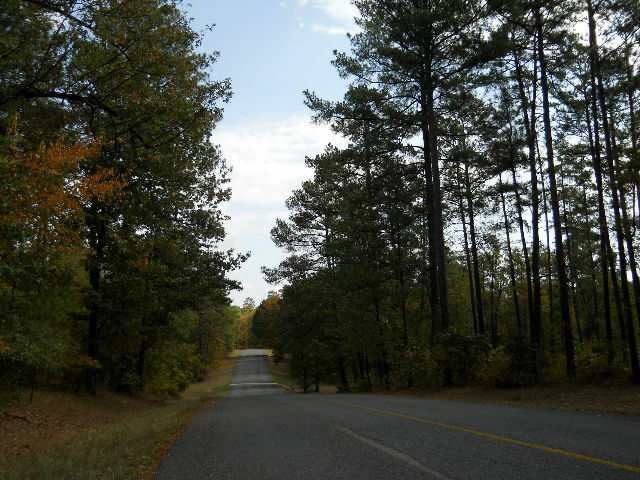 We drove south on US-59 from the park, through Texarkana to Nacogdoches where we stayed at Forest Country RV Park. This is a good one-stop park that has full hookups and Wi-Fi. Being close to the freeway makes it noisy, but we slept just fine. 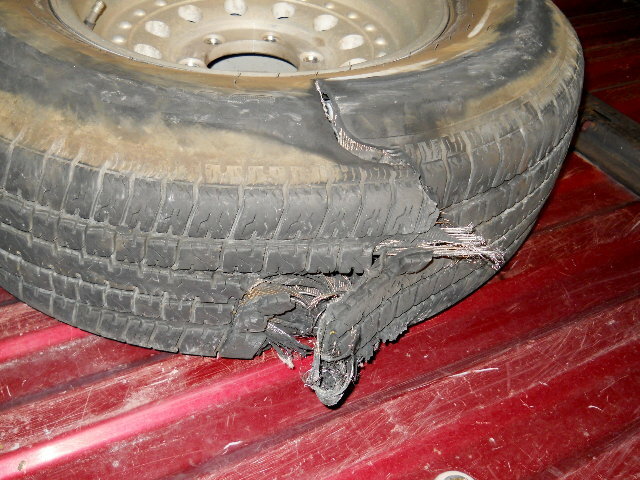 [Thursday] I would like to say that our trip home was uneventful, however, we had a blow-out on our trailer right front tire as we came into north Houston. We were able to safely get off the freeway and to a safe parking lot so that Lawson could change the tire and substitute the spare. Using the trailer tire jack that allows you to pull the trailers' good tire up onto the jack and it lifts your flat tire up off the ground made the change relatively easy. After this little event, we made it home OK. As a note, the cause of the blow-out was tread separation (manufacturing defect). We found the same problem on two more trailer tires. We now have a new set of tires on the trailer. < Tread separation can cause this!! This draws to a close our visit to Southwest Arkansas. We hope you enjoyed the photos and brief descriptions of our activities. God willing, join us again soon for another RV adventure.